Mr. Fogg is one of my favorite choices for coffee with friends during the day or as a first stop on a weekend night out. Three things about this bar really stand out to me: the steampunk decorated interior, the excellent coffee and great choice of fine imported liquors, like their Japanese whisky for example. The coziest spots in Mr. Fogg are the cute seats by the large windows. Perfect for sipping hot beverage while watching city life outside. On sunny days in spring and summer, my friends and I love to put on our sunglasses, sit on the terrace and have a glass of cooled white wine while a light breeze gently blows in fresh air. Here, the coffee is made with knowledge and care and the tea selection will please almost every tea lover. The beer list is quite small, but on the other hand, their selection of hard liquor is quite long and carefully made for those who like to take just a few fine shots. The service is fast and really polite. When having trouble deciding, they will give their recommendation with an honest smile. 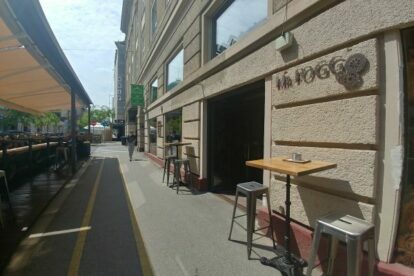 That and the ambience give Mr. Fogg a really pleasant and friendly feel which has made me a regular here.